Photo courtesy of Ian Duncan Smith. Now we have your curiosity, please read on. The driver of the Ford is Francis Edwin Birtles, an Australian pioneer cyclist that turned his attention to cars. Born in Melbourne in 1881, he joined the Colonial Army fighting in the Boer War. Upon his return he took up cycling. In 1905 he cycled Fremantle to Melbourne. In 1907-08 he cycled 5,175 miles from Sydney, Brisbane, Darwin, Alice, Adelaide to Sydney. 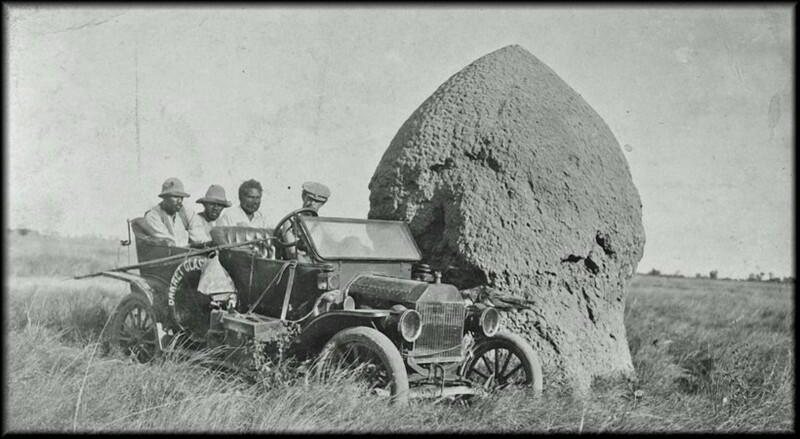 It was during this trip that he met Henry Dutton & Murray Aunger driving "Angelina" a 1908 Talbot 25HP on their second attempt trying to be the first to drive a car from South to North Australia, some 1,900 miles from Adelaide to Darwin. In 1909 cycled Freemantle to Sydney. In 1910-11 rode around Australia. 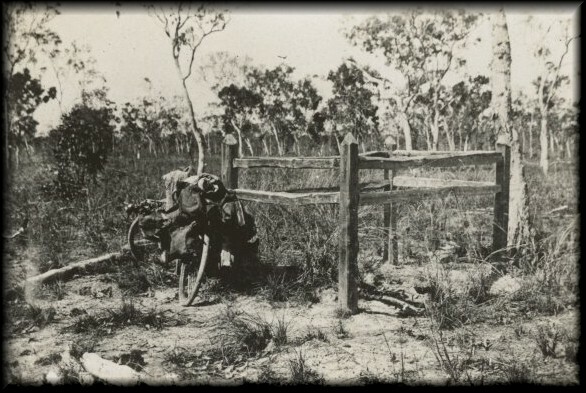 In 1911 rode Sydney to Darwin in just 31 days. 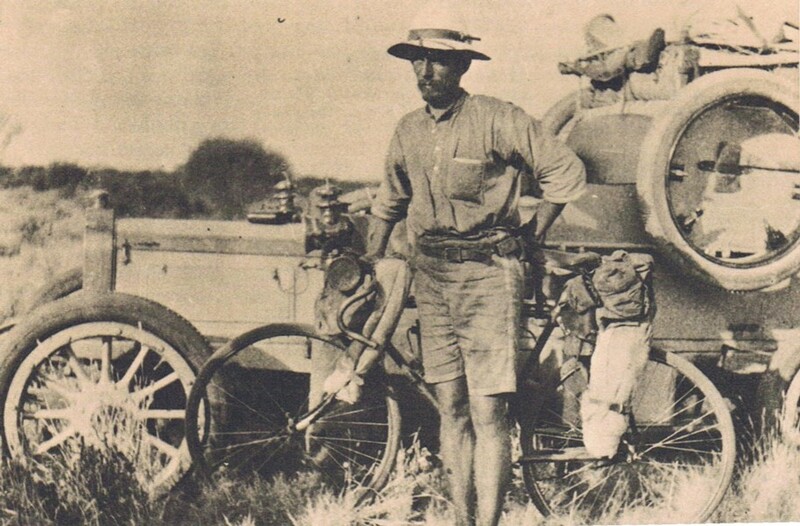 By 1912 Birtles had cycled across Australia 7 times & around it twice! Birtles then decided it was time for cars. 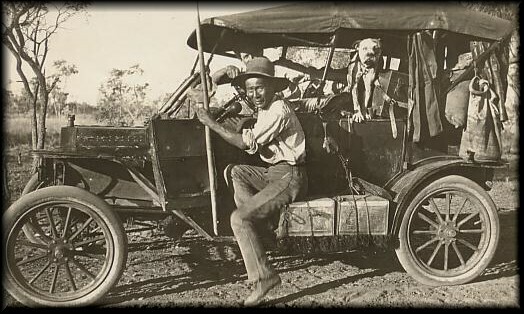 In 1912 he made the first West-East crossing of Australia by car from Perth to Sydney covering 2,600 miles in 28 days with co-driver Syd Ferguson & “Rex” the dog driving a single cylinder 1910 Brush 10HP. 1910 Brush 10 HP with Rex the dog. 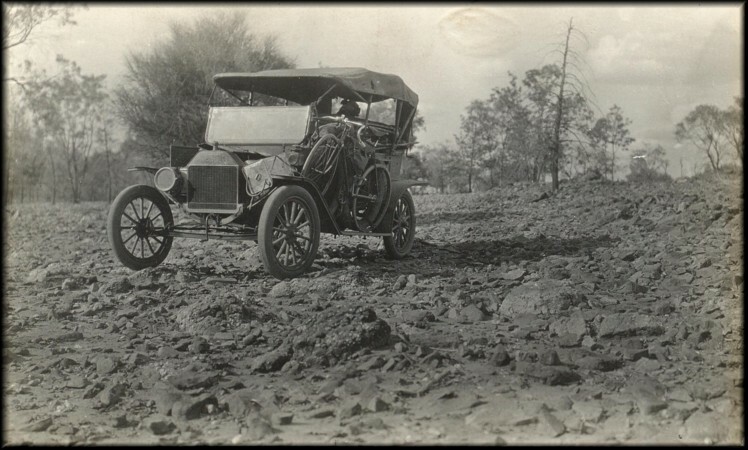 In 1913 Birtles was sponsored by the state Ford distributors and Barnett Glass Tyres to drive a 1913 Ford 3,500 miles from the Gulf of Carpentaria to Melbourne. 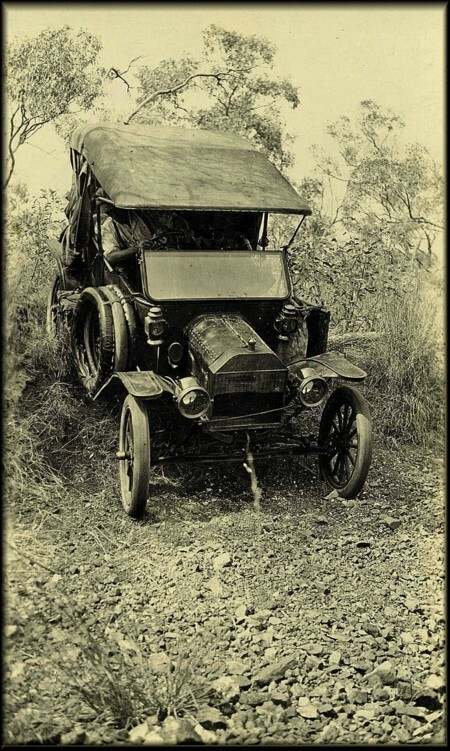 The new 1913 Ford was shipped to Darwin for the trip. The trip was another Ford sucess story and he made money selling the story to the newspapers of the day. Quotations are from extracts of Birtles articles and some are quite witty. 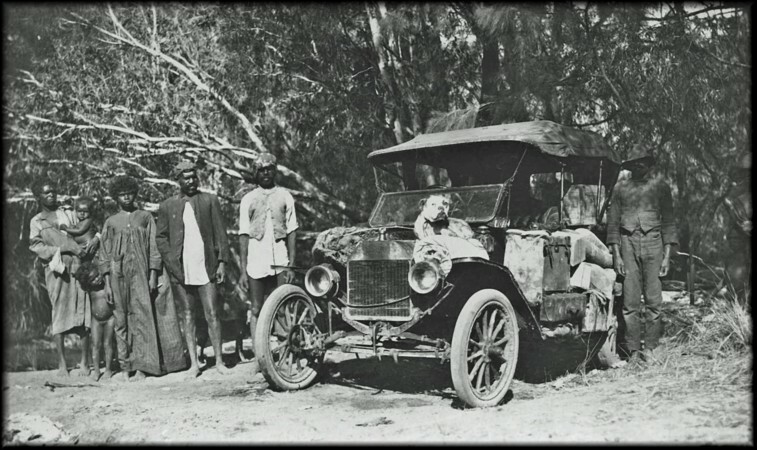 "The Ford requires no overhaul!” Local aboriginees in Northern Australia come and see Birtles and his car. Rex is working on his sun tan on the bonnett. Photo courtesy of Ian Duncan Smith. "Conditions were sometimes difficult". Conditions in the far north and in the Gulf Country become worse especially during the wet season. Rex was probably off doing things dogs do and is not in the photo. Note the dead goanna tied to the rear hood bracket for a future meal. Photo courtesy of Ian Duncan Smith. "Not a single puncture - Barnett Glass tyres". A termite mound in gulf country, Northern Australia. Poor Rex never made this photo either, he must of been devestated. Photo courtesy of Ian Duncan Smith. "Travelled 3,500 miles in 21 days”. Birtles and Rex at one of their many campsites. Photo courtesy of Ian Duncan Smith. “Averaged 25 miles per gallon”. Central Australia is a huge place and Birtles had to carry all of his own supplies and petrol. Supply dumps had been organised prior to his departure. Note his beloved cycle as back up transport. Rex has pride of place on the back seat. Photo courtesy of Ian Duncan Smith. 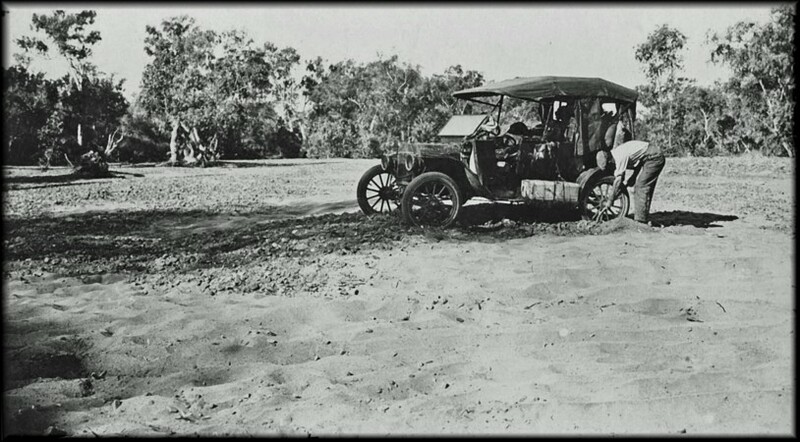 Birtles and Rex digging the bogged Ford out of a dry river bed in Central Australia. Photo courtesy of Ian Duncan Smith. "Little cheap Ford beat the big English £1000 car”. At one station Birtles bet some money on a race and won. Rex looks composed after his race win. Photo courtesy of Ian Duncan Smith. "Get good oil – the importance of good engine oils is not appreciated by the average owner”. Good advice still relevant today, this is one camp where "fresh" supplies were gathered. Rex resting under the front axle doesn't seem to bothered about some of his future meals. Photo courtesy of Ian Duncan Smith. The end of the trip. Great oppurtunity for a publicity photo with Rex at Tarrant Motors Pty. Ltd., the Victorian state Ford Distributor. 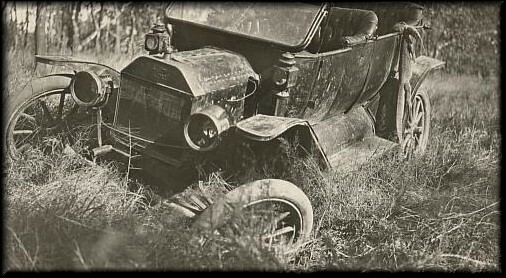 Photo courtesy of the Model 'T' Ford Club of Victoria. Birtles modified his Ford and did another huge trip in 1915. He also went on to drive the first car from London to Melbourne, amongst many other achievements including aviation. I have another installment about our intrepid pioneer Francis Birtles, but I will leave that up to the wishes of the forum readers. Dave C.
Neat Stuff. Do tell us more. Thank you so much for putting that story together and posting it for us. Yes, we would enjoy hearing more. You might also want to send a copy to one of the national magazines -- as many of their readers do not have access or do not visit the Forums. For those who are interested in additional details about Duncan & Fraser bodied Model T Fords in Australia, I would highly recommend you contact Dave and ask him about his book “Duncan & Fraser Ltd. ‘Legacies Left Untold.’” It includes lots more information than just their Model T work, but it also has lots and lots of great photos of some beautiful bodied Model Ts as well as few pictures of the more standard bodied Fords. 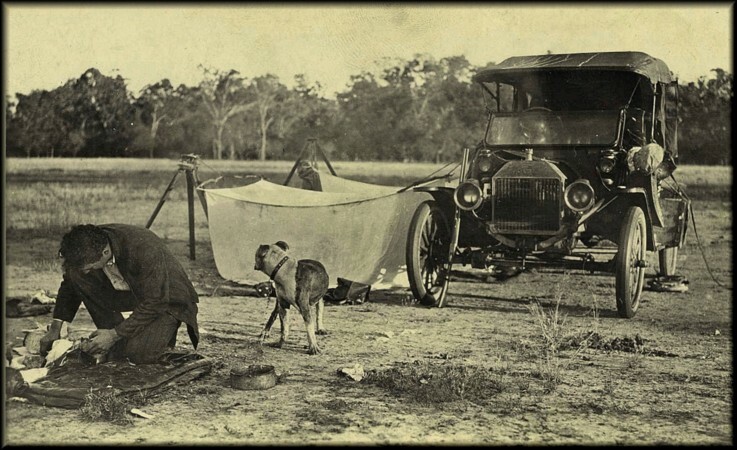 It provides a great look at how the Universal Car evolved in Southern Australia. Hap Tucker 19l5 Model T Ford touring cut off and made into a pickup truck and l907 Model S Runabout. Sumter SC. Well done Dave, You never cease to amaze me with the stories and photo's that you get !! Great photo's and story about Francis Birtles. I have often wondered why no one has made a film about him or at least a documentry. Some of the things he did were truely amazing. I was told a little side line about Birtles trip by one of our great T historians George Roberts. George only passed away a few months ago aged 99. ( 4 months short of hs 100th). 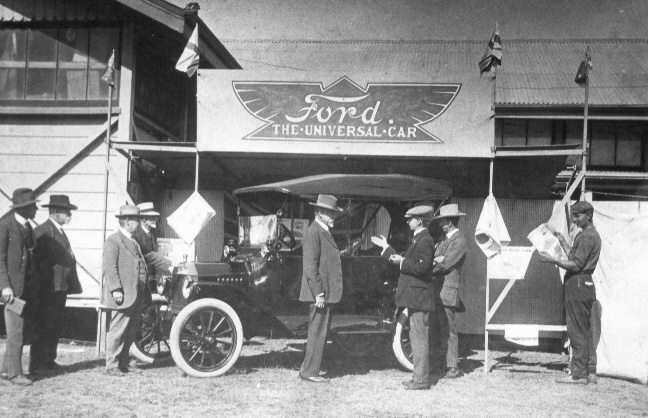 Georges father had a Ford agency in Ipswich Queensland during the teens and twenties. He sold a Model T touring to a customer who had to leave his Model T down the hill a fair way from his house. He came out one morning started his car and found it running poorly making noises and blowing smoke. he drove it to town and complained and when they looked at the T found the engine had been swapped. Upon further investigation they discovered that the motor was from Francis Birtles car and that he had passed through the area the day before. Seems Birtles saw the unattended car, knew he was in trouble and a long way from home to finish the trip he had been payed to do by the Ford distributors and took advantage of the situation. I asked George if the car was actually put together. 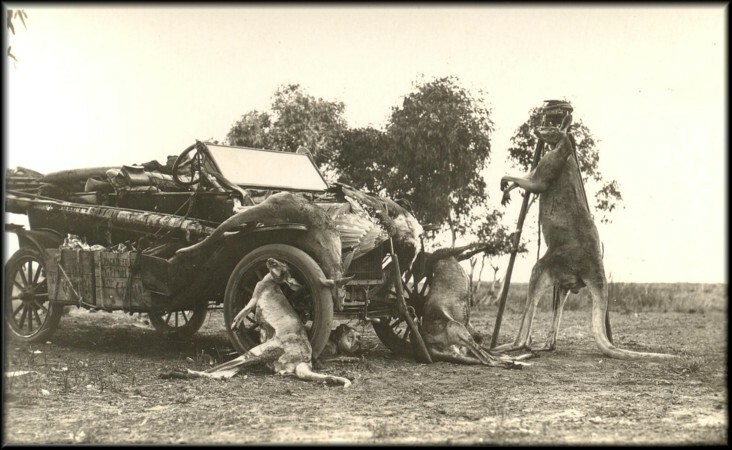 it would have been a lot of work to just get the good motor into his car but he assured me the car was put back together, they must have been a more gentlemeny in those days. The incident was hushed up and the trip gave the Ford distributors the publicity they were after. They even printed a booklet of the trip from Birtles diary. Here is a picture of Albert Roberts stand at the 1915 Ipwich show that George gave me many years ago. Thats his dad in the center facing left with the cap on. Bravo! David, Great pic's and info. I think I have a copy of that booklet somewhere Peter. I just joined. Tho I have been visiting for a while. That was an interesting story. This is fantastic stuff! Would love to hear and see more! Do it again Dave, this really brings history alive! Thanks for this posting this. A few of small corrections though. Birtles dog 'Rex' can be seen only in the photo of the 1910 Brush car. In all the other photos showing a dog, it's a different dog called "Wowser". 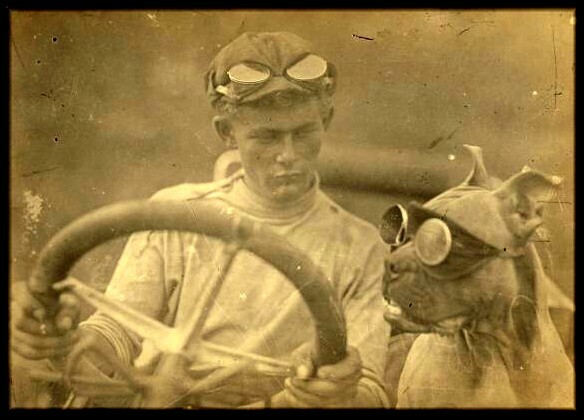 The driver in the photo with Wowser wearing goggles (l believe this photo is from 1916) is Francis Birtles younger brother Clive. 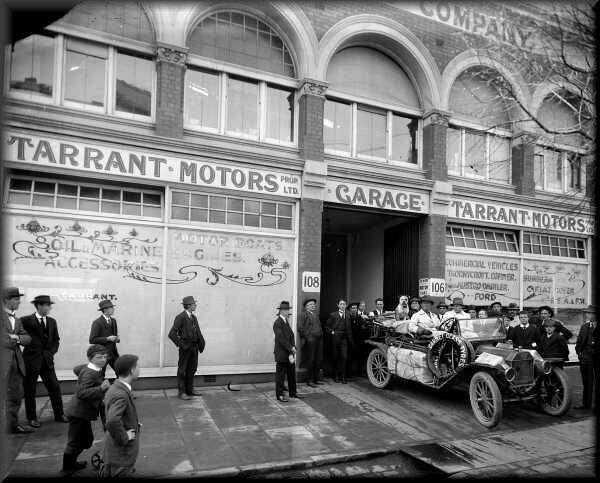 The photo of the two Birtles brothers and Wowser in a model T outside Tarrant Motors Pty. Ltd. in Melbourne is l believe of them them departing not arriving. 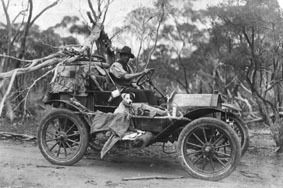 In 1913 Francis Birtles drove a model T Ford from Bourketown in Queensland to Melbourne arriving on the 24th of December 1913. In Autumn 1914, Francis Birtles again set off on another adventure in a model T Ford. This time, from Melbourne to Sydney, then to Port Darwin, down the west coast of Australia to Perth, then east to Adelaide then to Melbourne; a journey of more than 10000 miles. In Sydney he was joined the famous Australian photographer and filmmaker Frank Hurley. They departed Sydney on Good Friday 1914. In this photo, the tree without leaves and the way people are dressed indicate this is not December 1913 (the middle of summer). Furthermore, his and Clive's clean matching coats, as well as a huge amount of luggage carefully arranged indicate that they are departing not arriving. So it is likely that this is a photo of Birtles departing Melbourne in Autumn 1914 on his way to Sydney. Wow! 25 MPG, and not a single puncture! I really enjoyed reading that, and great pictures. One hardy individual for sure. The engine swap is priceless. I wonder if he had Australia's version of Signal Oil's go farther gasoline? Don't forget that is 25 to a full Imperial gallon, not the US gallon, where it would be more like 20mpg - still pretty amazing in those conditions. The latest Restored Cars mag has a 4p story on him. Great, I hope it will give us some more detailed information (and correct more of mine! )Dave C.